We have all been there. We solve problem after problem, yet the big goal seems no closer than before. We get tired, even tired of success. Because right after that success, the ugly head of another problem rears itself. 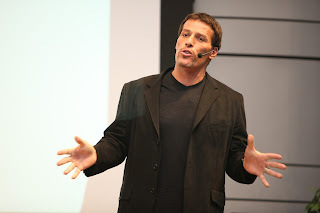 I am a fan of Anthony Robbins. I am a fan because Anthony Robbins relentlessly pushes you to become better, to be successful and to achieve your goals. And he does so without being condescending and finding the best in everybody and everything. He may not get his facts right all the time but he understands that being a public figure with recorded audio and video, his mistakes stick around longer than most people. But that does not slow him down. He taught me to think, "What is it I need to do achieve my goals" and "What needs to happen for me to achieve my goals and what can I do to make it happen". Now this temperament is also applicable to homicidal maniacs and sociopaths, so passing that through your moral code is a must. But in most cases, these ideas have helped me out when I run out of solutions or possible solutions. The first idea is more of a wake up call. It is not so much asking you to do something, it is asking you to do anything instead of nothing. It is asking you to think up of something to do to in the pursuit of your objective. It is a call to action. The second idea is more cerebral and goes towards thinking of what do to. It does not look only at the problem or you but also the environment. The driving idea is this: Success is possible when conditions of success is met. Once you figured that out, now what are you going to do about it. What are you going to do to change the environment so that success is possible. Changing the environment helps you focus on something than the problem directly and something that is possible to change. Anthony Robbins is a smart man. He is even a smarter speaker. You should spend the time to listen to him. Sometimes one of the best things to do when we are tired, is to stop and listen to someone who wants you to succeed.